I hope everyone out there spent a great weekend and also wishing their mom's a very HAPPY MOTHERS DAY. My Mom was out of town last week so I called her up and wished her. And every year whenever I wish her on this day, she immediately rings her mom and wishes her. She is the best Mom in the whole wide world. Well ! Everyone out there might have said the same to their mom. Because Moms are great. After marriage and now being a mom myself, I feel what exactly was her priorities in her life that's none other than her kids. Love U Mummy. This is a very simple and still my favorite sweet dish and I actually love it more when mummy prepares it. Whenever there is a function at home, Kheer part is my mom's department and everyone though know the recipe still ask once from her because its such a finger licking good recipe. She adds Sabudana to this and I skipped it here. Its my hubby's favorite dish too. He likes to have this Kheer or Payasa with hot puris and its my mom who fulfils this demand every time when he is around. Love u mom. I think this is the first sweet dish I prepared for my husband after marriage. 1. Fry Raisins and Cashewnuts in ghee and keep aside. 2. Roast Vermicelli with the ghee in the same Kadai. I prefer already roasted MTR / Bambino vermicelli packets. Add a tsp or two rava along with vermicelli and roast it for 3-4 mins. 3. Now add water and cook vermicelli/ shavige. This step helps vermicelli to absorb less milk. 4. Now add sugar as per your taste and cook till vermicelli is done. 5. Add boiled and cooled milk and cook it in a low flame till kheer thickens a bit. 6. Lastly add powdered Cardamom/ elachi powder, fried nuts and Mix well. 7. 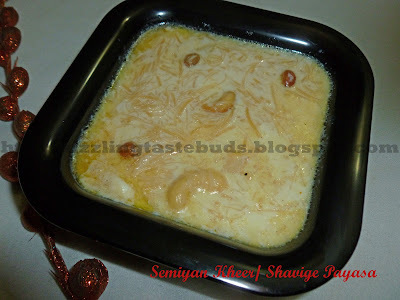 Delicious Semiya or Shavige Kheer/ Payasa is ready to serve. Enjoy it either way hot or cold.